Examples of common surgeries performed at Meadows Veterinary Clinic: canine and feline spay and neuter, declaw, canine dewclaw removal, tumor removal, bladder stone removal, and gastrointestinal tract procedures. Our goals for surgery revolve around safety with a quick return to health and activity. We incorporate pre-anesthetic bloodwork and careful monitoring for all surgical procedures in order to assess individual anesthetic risk and adjust medications as needed. We are firm advocates for pain relief- employing pre-operative and post-operative pain relieving medications as well as laser therapy. Laser therapy is a technique of applying laser light to surgical sites in order to decrease inflammation and pain while speeding healing. Our care doesn't end when surgery is complete- each patient is given detailed discharge instructions for home care to get your pet on the fast track to recovery. Treatment plans, which include costs, are available upon request. We welcome your questions- please don't hesitate to ask! We now offer cryosurgery for our patients! 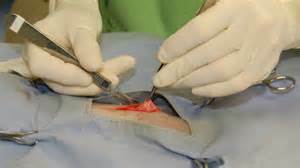 Cryosurgery is a way of "freezing" small growths off the skin surface using cold pressurized gas. This method of growth removal is less invasive than typical scalpel surgery and can often be performed without general anesthesia (depending on pet temperament and the location of the growth to be removed). Ask our veterinarian for details!